Thunder forward Nick Collison scores two on a slam dunk during Sunday's win over the Los Angeles Clippers. Steven Adams shoots a free throw one-handed after injuring his right hand on the previous play. Adams finished with five points and two rebounds before leaving the game. Russell Westbrook fires a pass to teammate Mitch McGary who finished with career highs of 19 points and 10 rebounds. Kevin Durant attempts a shot while being held by Clipper Harrison Barnes. Durant finished with a team-high 29 points. Russell Westbrook tries to sneak a pass to teammate Serge Ibaka during Sunday's game. Mitch McGary finishes a dunk over Clipper Glen Davis during first half action. Serge Ibaka records one of his two blocks against Los Angeles. 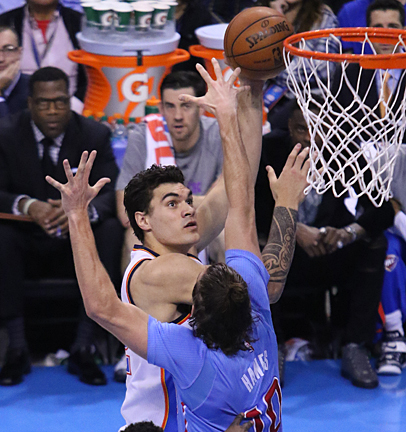 Steven Adams scores two of his five points before leaving with a hand injury in the first half. McGary, plagued by injuries most of the season, scored 19 points and grabbed 10 rebounds, recording the first double-double of his short professional career. McGary, playing in only his third game, was averaging 1.5 points and two rebounds prior to Sunday. After being substituted in the second half, the energetic McGary threw his arms into the air gesturing for the Thunder faithful to get loud. His effort wasn’t in vain. Thunder head coach Scott Brooks had praise for the rookie and his dedication to getting better and overcoming the pre-season injuries. The kind comments didn’t stop there. However, it was the always-humble Durant who got the Thunder rolling in the first quarter after a relatively tame start. With Oklahoma City ahead 7-5, Durant scored the Thunder’s next 15 points, including three consecutive buckets that gave Oklahoma City a 22-18 lead. The Thunder (26-25) finished the first quarter on a 6-0 run highlighted by two baskets by McGary and a jump shot by backup point guard Reggie Jackson to lead 28-26. From there, the game belonged to the Thunder, outscoring the Clippers 38-30 in the second quarter and 35-19 in the third quarter. Oklahoma City led by as many as 32 points midway through the final quarter when Jeremy Lamb connected on a three-point shot. Durant led the Thunder in scoring with 29 points on 10 of 15 shots and seven of seven free throw attempts. Westbrook, who had tallied 93 points in the previous two games, scored 19 on six of 19 shots and six free throws. Other Oklahoma City players in double figures were Dion Waiters with 16, Reggie Jackson with 15 and Serge Ibaka with 13. Oklahoma City’s dominance on the boards was obvious with the Thunder grabbing more rebounds, 54-29. Westbrook was the Thunder’s leading rebounder with 11 followed by McGary’s 10. Oklahoma City also grabbed 16 offensive rebounds compared to eight by Los Angeles (33-19). However, those lopsided numbers could be attributed, in part, to the absence of Clipper forward Blake Griffin who is suffering from a staph infection in his right elbow. Spencer Hawes replaced Griffin in the starting lineup and scored 17 points. It’s possible McGary might get a lot more playing time with the hand injury suffered by Thunder starting center Steven Adams. After hurting his hand, Adams immediately ran into the tunnel and toward the locker room. However, he was forced to return to shoot two free throws after being fouled on the previous play. Unable to use his right hand, Adams shot the free throws with his left hand only, making one of two attempts much to the delight of the Thunder fans. Adams finished with five points and two rebounds. Backup center Kendrick Perkins was unavailable for Sunday’s game while serving a suspension the NBA levied against him for head butting Tyreke Evans during Friday’s game with New Orleans. The win left Oklahoma City 2 ½ games behind Phoenix for the eighth playoff spot in the Western Conference and one game behind New Orleans, which currently holds the No. 9 spot in the West. Phoenix, currently the No. 8 team, played Sacramento late Sunday night. New Orleans received bad news Saturday when star player Anthony Davis went down with a right shoulder sprain. He is listed as day-to-day. GAME NOTES: Oklahoma City plays at Northwest Division rival Denver Monday night, and then returns home for a pair of games against Memphis on Feb. 11 and Dallas on Feb. 19. Sandwiched between the home matchups is NBA All-Star Week in New York City…Oklahoma City scored more points in the paint (54-44), had more second-chance points (27-22) and more fast break points (33-12)…As a team, Oklahoma City shot 52 percent from the field compared to 46 percent for the Clippers.